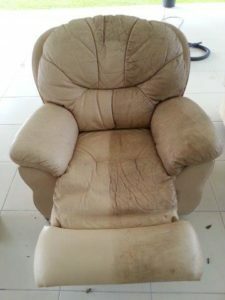 Cairns Leather Care have specialised in cleaning & protection of most leathers in Far North Queensland. Most important, the leather must be correctly identified before any solution is applied to it. Leather furniture is probably the most expensive furniture item in your home or office, so it make sense that you should have a qualified Leather Technician care for it. We are proud of the fact that we have undertaken many courses from the leather care suppliers that are recommended by most of the world’s major leather tanneries. If leather was easy to maintain, why are there not many Leather Technicians available.? Here’s a couple of during & after cleaning photos, note that there are also abrasions on the leather.